Joseph 'Skipper' Funderburg, author of Surfing on the Cape Fear Coast, has continued to research the old postcards of North Carolina beach scenes, some of which he has in his book. Last month, a postcard originally dated as printed circa 1908-1909, turns out to have been printed circa 1906-1907. Another copy of the postcard hand-dated 1909 has been found with a hand-date of 1907. The postcard is a photographic view of a large crowd of people surf bathing on the ocean side of the Sea Shore Hotel. The 1907 postcard clearly shows a surfer on a Hawaiian style body board. This type of board has been called a paipo ever since the 1960s, but is more accurately termed a kioe. “The companies would use different coloring and sometimes add small details and crop out others... The transcription of the message on the front of the postcard was published in 1907, but the photograph could date a year or more earlier... Funderburg’s research and statements upholds the accuracy and authenticity of the postcard.” Steve Massengill is an expert on the history of picture postcards, having worked in the field of non-textual materials as a public historian and having published several works in the field. Prior to the days of automobile access, the location is on the old railroad line at Station Three. The Sea Shore Hotel had a magnificent view out to sea and a gently sloping beach leading to the ocean and the surf. 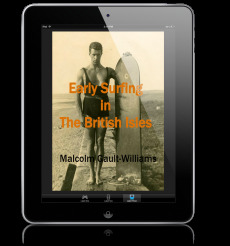 We do not know exactly when surf bathers began to use Hawaiian kioe templates. 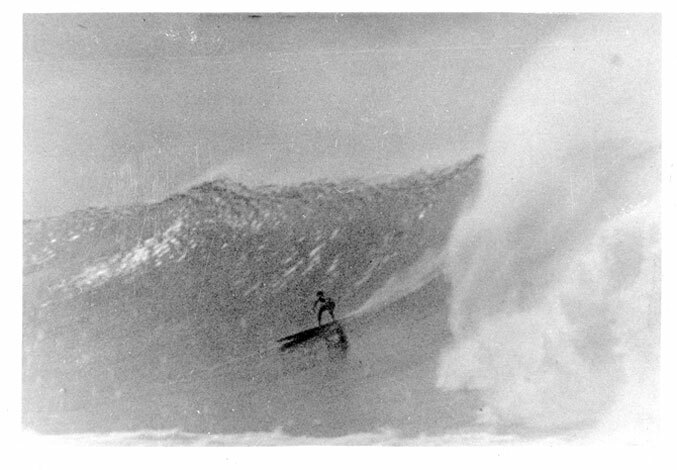 Skipper and I have corresponded with each other on this question and, although we cannot prove it, we believe that the introduction of the Hawaiian kioe was due to Alexander Hume Ford, a South Carolina native who played a big part in the revival of surfing at Waikiki during the first decade of the Twentieth Century. The 1907 postcard came to Skipper's attention when The Dr. Robert M. Fales Photo Collection was recently digitized. The collection is comprised of thousands of 35 MM slides, plus an index catalog that contains slide numbers and brief descriptions. Unfortunately, Dr. Fales did not photograph the backs of the postcards or photocards, but he did capture many images on the photographic side. The State of North Carolina provided the grant to digitize Dr. Fales invaluable photographic collection. 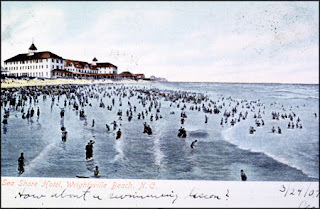 According to Funderburg, Wrightsville Beach postcards have always been popular among collectors and usually command decent prices. Postcard companies would hire photographers, either local or itinerant, to take pictures of tourist spots. Then the companies would produce multiple printed cards of photos in hopes of cashing in on tourists and vacationers mailing cards back to loved ones. North Carolina postcards were not prevalent until after 1906, and postcards prior to 1912 were printed in Germany. After 1912, postcards were printed in England and the USA, due to the war with Germany. Antique or penny postcards, evoke memories of the past and provide an interesting glimpse into social, cultural and material history of the time. Historians use real photo postcards and their postmarks, to document local historical events. Vintage waterfront postcards, in particular, are prized by seaside historians. Postcard collecting is surpassed in popularity, only by coin and stamp collecting. The Golden Age of postcards is 1898 – 1913.